I'm always looking for way to save money and decided to focus on a big energy abuser in our household - for this blog post - our dehumidifier during the summer time. My problem is an old inefficient dehumidifier combined with summertime energy price spikes from the real time pricing program (RRTP) with ComEd. We had a dehumidifier that was almost 20 years old. It still "worked", but was really bad at reliably removing moisture from our basement. It had gotten to the point where it would run 24/7 constantly, freeze up from time to time, and remove moisture at a slow rate. I had to empty the bucket about every 4 days. My target moisture level in our dry basement was 45%, but that unit would only keep it about 55%. We recently joined ComEd's real time electricity pricing program and have saved a lot of money (http://blog.trebacz.com/2013/03/comed-electrical-rrtp-savings-program-6.html). I knew that a 24/7 dehumidifier (essentially small air conditioner) was probably costing me more money than a replacement model would cost to buy and run. About a year ago -I removed the cover and cleaned all the dust out of it with an air compressor. Lubricated the fan bearings. All in an effort to make it more efficient at move air through to eliminate the icing. Bottom line was it was time for a new dehumidifier -and one that I'm sure would be more more efficent than this old one. Compressor technology and efficiency (think refrigerator) has come a long way in 20 years. I looked at many places for advice on my next dehumidifier. My choice was the Danby DDR70A2GP. Based on the reviews I decided to purchase an extended warranty (as a rule I never do this). It seemed to make sense, since dehumidifiers in this price range ~$225 -seem to have a bad reputation. Perhaps the details on the new energy efficient compressors are still being worked out. I bought mine at our local Farm and Fleet (http://www.farmandfleet.com/products/772503-danby-dehumidifier.html#.UfVMaRdDt58). They had it in stock, on sale for $199, and offered an extended warranty. I bought 15 amp Intermatic TN311 manual timer to control the period of time when it can run. I looked at a bunch of "cooler" options, but the simple high amperage clock timer seemed to be the best (and inexpensive) option. I really wanted something "smart" that would kill the power when rates were over a threshold (like the ComEd switches on my air conditioners), but it doesn't appear things have progressed that far yet. After using it for about 1 month -my basement "feels" dryer than it ever has in the middle of summer. Monitoring the humidity show it's staying much lower than before. That little bit of mustiness is gone. 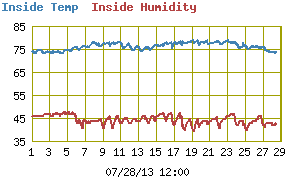 You can see the live trebacz basement temperature and humidity here. That's courtesy of my Davis weather station logger. The bucket currently fills up once a day. I use the dehumidifier water as a cheap distilled water source for our outdoor water fountain. If I ever don't need the water, I plan to just let it go straight to the drain. I'm pleased to have it running at the off times of the night when my power is much less expensive. On some days 5 times less expensive. It seems to pull out enough during that 12 hour period to weather the 12 hours when it can't run (due to the timer). I have seen the unit kick into it's low temperature mode -and seems to be working since it's pulling a lot of water out of the air each night -every night. I hope this post helps you decide to replace your old dehumidifier and think about adding a timer to take advantage of lower electricity rates, if your own a real time pricing program. The extended warranty should keep the system covered for quite awhile.